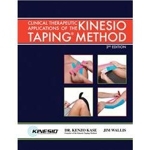 The books and DVD are tools to help you learn the Kinesio® Taping Technique. However, for the medical professional, the BEST and quickest way to learn The scheduled (open) Taping Lab presented by an experienced Certified Kinesio® Taping Instructor. Better Yet, sponsor a Lab in your locale – economically it takes 12 to 18 people [6 to 9 taping pairs] then EVERYONE receives Kinesio® instructions directly from an instructor of your choice and one that fits your needs. There are Taping Labs [both of the ‘open’ and ‘closed’ type] going on some place in the United States most months.